The Class of 2016 is the only team thus far to win a game since the almost undefeated record of Class of 2015. It comes just as fast as it goes. 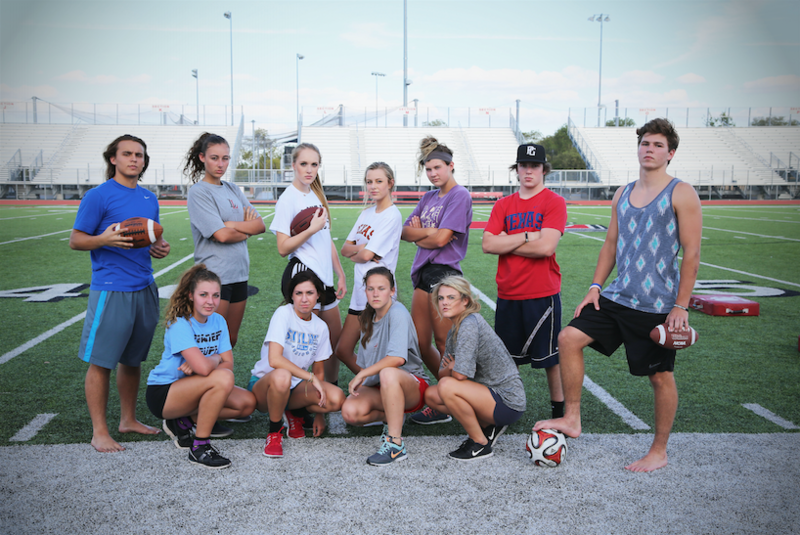 The 2015 Powderpuff season will be deciding a champion tomorrow between the top four teams of the school. The three-game season kicks off with the seniors vs. the freshmen followed by the juniors vs. the sophomores. In the midst of the September heat, these girls, coached and cheered on by semi-qualified men of fall. The weight of every student in their class falls on the shoulders of these 10 girls to take home the gold. The Red Ledger contacted the star players and coaches of each team to analyze and evaluate the competition. The senior team has not spent a single minute out of the headlines, whether it’s the injury of star player Jaclyn Willis, the broken thumb of Emma Lescher, or the biased treatment by the LPPL referees. With all this attention, will the seniors fly or flop? Kaylee Grigg is certainly flying towards a league record 100 touchdowns in her career and the preseason has shown her not stopping for anything. The coaching of the seniors has been praised as one of the best the league has seen as well. But only weeks ago LPPL hall-of-famer Katie Curry made her bold prediction of a senior loss in the finals of the LPPL this year. All eyes lie on the LPPL final and whether the prediction holds true. The Red Ledger: Kaylee Grigg is unstoppable. She has had 2,000 yards in her three-year career with 21 touchdowns as well. Will we see this performance continue? Coach CJ Vogel: Absolutely, there’s no stopping Kaylee. You can game plan all you want, but once you give her the ball, she’s not going down without a fight. Expect several more touchdowns this year, especially against the juniors. TRL: Everybody won’t stop talking about it. The injury of star player Jaclyn Willis is a huge loss to the senior team. How will you overcome? CJV: It’s absolutely a loss, everyone who played her last year is probably happy she isn’t playing this year. It’s a huge loss, but we have new girls coming up that have big expectations this year. Kaylee Grigg: It’s definitely a huge loss, I’m hoping to step in and fill her shoes. TRL: Rachel Willmann has big expectations. Her viral video of the insane one-handed catch that has been seen 1,000,000,000 times on YouTube has made her famous. How is she faring with these high expectations? CJV: Oh she’s ready no doubt. She’ll be mossin’ players left and right. Throwin up the x. There’s no stopping her on the outside, there’s no one like her on the field. She’s definitely the tallest on the field. TRL: In your LPPL career, the referees have been uncharacteristically unfair towards your team. How do you challenge the refs without them ejecting you? CJV: Well, I know last year a few calls go in our favor, but definitely more questionable calls went against us. With no disrespect to the referees, I hope they do their job this year well, but I may have to remind the referees a bit how seriously I take this. But I have no doubt in my mind that they will get every call right, especially when it comes to 50/50, they’ll go with the seniors. KG: I’m really hoping they make the right calls. TRL: LPPL hall-of-famer Katie Courie has predicted a senior defeat in the finals of the LPPL. How can you argue with a player of such experience? CJV: You know Katie has won three championships, but she’s not here to win a fourth so. She ran all over us last year, but there’s no stopping us this year. KG: She obviously hasn’t seen us this year, she doesn’t know our new strong points. She wouldn’t know what to expect if she played us. TRL: Analysts have called the coaching squad of the seniors “One of the best we’ve ever seen.” Why do you think you are the best? CJV: I mean, no one’s better, right? TRL: The senior team is famous for its kickoff and punt returns for touchdowns. Have you guys been working on that in the preseason? CJV: Oh yeah, most definitely. We also have a couple trick plays up our sleeves. Just get ready for anything. Analysts have given the juniors the coveted #1 ranking coming out of the preseason. This is quite a surprise as the juniors have yet to win a game in their history in the LPPL. The ranking comes because of the immense talent the juniors bring with Jojo McRae, whom many say is a shoo-in for MVP this year. McRae looked amazing in the preseason, averaging 400 yards a game with more than 50 carries. Emily Weichel also brings promise to the juniors as she was the #1 pick in the LPPL draft and her time in the middle school PPL saw her team go undefeated and win three championships. The coaching of the juniors have a lot to prove however as Coach Pfaff has to fill his brother’s legacy. Will they continue to be winless this year or will the trend be broken? The Red Ledger: Though you haven’t won a game in the LPPL, analysts rank you #1 in preseason rankings. Will you live up to this ranking? Coach Blake Pfaff: I believe we will. It is most definitely a deserving ranking considering the way we’ve played in the past and the players we have coming back this year. JoJo McRae: This year especially we have a bunch of new plays and new strategies we’re coming out with. I think it will go in our favor. TRL: Jojo McRae, you are owned in 100 percent of fantasy powder puff leagues and analysts have you the highest projected player with 500 yards and 5 touchdowns. Will you fulfill this tall order? JM: We’re incorporating new plays which are going to help a lot. We’re changing it up a lot this year opposed to the past two. TRL: The juniors had the first draft pick in the LPPL Draft and chose Emily Weichel. Has she lived up to her potential? BP: She has done very well and has performed very well in practices. I have high expectations for her and other girls on the team. TRL: A photograph went viral on twitter that showed star player Emily Weichel in a *reporter holds off vomit in his mouth* green prosper shirt. Emily has stated it to be the work of Photoshop though the damage has been done. How will this controversy affect her play? BP: I know Emily’s intentions and her intentions are to not support the people in green. We as a team will not support the people in green and that is that. JM: Knowing Emily, I don’t think it will affect her at all. She gets really into the game and we’re really close as a team. TRL: Coach Pfaff, your brother left a legacy in the LPPL, leading his team to a 3-1 career. He was recently inducted into the LPPL hall of fame. His coaching style was never seen before and we’ve seen his teachings in some of your own plays. The problem is, it hasn’t been working out too well. How will you live up to your brother’s legacy? BP: I think freshman year was definitely tough because it was a new experience. Last year we should have won but a few calls by the officials didn’t go our way, just bad play calling. TRL: Coach Pfaff, your relationship with a sophomore is well known by the junior fans who question your motives. Will this hinder your ability to coach at all considering you face the sophomores in your first game? BP: You know, she may get mad at me for saying this, but the football team goes before my personal life. And that is that. Last year the sophomore team suffered a degrading loss to the graduating class of 2015 as they tossed them to the floor, smashed them, and enjoyed some refreshing Leopardade®, Official Drink of the LPPL, before giving them a wet willy…metaphorically of course. Controversial play calls, disappointing performances, and news-inciting actions by players outside of the game have plagued the team ever since. The long rebuilding process has begun and the sophomores have been handed an opportunity to prove themselves as they face the juniors though they will have to somehow contain JoJo McRae. TRL: Last year’s game was something that you obviously want to forget. A 58-8 loss where the only points you scored were for spirit from generous referees. How are you guys forgetting the past and moving on? Callie Mayfield: We’re just trying to play hard and move on. We’re practicing this year, which we didn’t last year. Being serious at practice as well. TRL: Both teams in this game have not won a game in the LPPL though the juniors have lost one more than sophomores. Does this affect your enthusiasm? CM: It encourages us because we hope to have a chance to make it to the finals. BP: Not at all. we’re going to go out with the same mentally as if they were undefeated. Go out there and have fun, get some points on the board. TRL: Quarterback Callie Mayfield has taken flack for her performance in last years game. How is she coping? CM: I don’t really know. Just trying not to remember the last game. Playing hard at practice helps as well. BP: She’s a fighter. She did have a bad game but were also going to forget about and hopefully she gives it her all. TRL: Coach Pool, your controversial call to pass so close to end zone when the sophomore team has such a strong backfield blew up in your face as this year’s current senior team made you pay for that call, intercepting and scoring a touchdown. What do you say to your critics? BP: It’s just one of those in-game decisions that didn’t work out. The wide receiver was open and unfortunately our quarterback couldn’t put the ball in the right place for her. TRL: Running back Kaylee Reikeita has come under fire for her behavior during press conferences, often answering questions with one-word answers. Do you support or condone this behavior? CM: I support it. She is a quiet person and I understand where she is coming from. She’s a great running back. BP: It’s her freedom of speech. She can say what she wants and doesn’t want. We’re going to let the play on the field dictate. TRL: You have one year in the LPPL under your belt, what have you learned? CM: You should definitely practice before going out there. Just make sure to be serious but also have fun while you are at it. BP: It’s the ones who are most physical and want the win the most. TRL: How are you going to defend the offensive prowess of Jojo McRae? CM: She’s very quick. So we’re trying to put our best people out there when she’s on the field. I think it’s definitely possible to stop her though. BP: Make sure she doesn’t get outside, focus her on the inside. “Untested”, “Not fit for professional powder puff”, “A B-team at most.” Analysts have ripped the freshman team apart in every which way. With good reason, this is their first year in the LPPL and are facing the senior team. The offensive prowess of Emma Lescher and Kaylee Grigg has been difficult for even experienced teams to handle. But all hope is not lost. New recruits have been impressing many senior analysts and turning a few heads in the coaching offices of upper classmen. Will they be enough? Will the freshman prove their doubters wrong? The Red Ledger: This is your first year in the LPPL. How are you guys going to stack up against the seniors who are beginning their fourth year in the league? Lizzie Weichel: We are going to do good. We have all our positions and plays set so if we can just hold them defensively we have a good chance. Coach Michael DiFiore: We got some plays and I think our team is ready. We got some secret weapons we are going to use against them. We got speed and ability. TRL: PP has seen bloodshed. Bones pop out of skin, and hair been ripped from heads. Does this intimidate you at all? LW: Totally not intimidating. We are so ready and we are definitely going to be physical and fight for the win. MD: Not at all. I think our girls are tough and are ready to take hits. TRL: Do you believe the seeding of the tournament to be unfair? LW: I think the freshman can overcome all odds, but maybe. I mean, they are three years older than us. MD: Yes, freshmen are the ones to pick on, but we can prove them wrong. TRL: How does star of the senior team Jaclyn Willis being injured and unable to play affect your strategy going into the game? LW: It gives us more confidence definitely, if we can just hold off their other star players and do well on offense, we are golden. LW: He has no idea what’s coming and he is highly ill-informed if he thinks that. MD: We’ll fight you at the high school or at the middle school, take your pick. Result is the same. TRL: Your team has seen a lot of scrutiny for its choice of name. What makes you think you’re so fresh? LW: We’re fresh because we are good. Our offense is number 1 and even though we have one sub, it won’t even matter. We are totally up for the challenge. MD: I think we’re cocky and young which makes it fun and competitive. TRL: Our team of analysts, the best this country has to offer, have given your team a 1 percent chance to win against the seniors. How will you overcome? LW: I didn’t realize how much of an underdog they think we are. We are going to overcome because we have fight and grit. MD: They need to analyze it again because I think it’s 100 percent. Follow the Red Ledger on Twitter @theredledgerlhs to find all of your Powderpuff updates. Editor’s note: Not all of these stats are accurate, and many are over-exaggerated for humorous effect. This is some A-Class writing, kind of stuff I’d expect out of a brother of mine. You’re more than filling my shoes. Everyone at the Red Ledger should be bowing down to you, especially Hallie Fischer.